You've inspired me to actually get dressed today. I work from home as well, and typically stay in yoga pants and a tshirt, if not my flannel pajamas. ;) I have a similar skirt from Target and the versatility is certainly impressive. Re the self-tan, morning jogs have kept me out of the drugstore and more into the natural tan category, which is a nice change for me. But since fall weather is fast approaching, I may check to see if Soltan is available in the U.S. I love the Clarins autobronzant serie, specially Lisse Minute Autobronzant instant tanner. Easy, good, not irritating me. Love the skirt! And if you want the Henna to fade faster, cut a lemon in half and rub it all over the Henna. The citric acid helps fade the dye much faster! Yes, yes, yes - I had exactly the same relationship with my AA pencil skirts. I bought two in the sale and they just looked so tiny when they arrived I threw them to the back of my wardrobe. The day I actually tried one of them on I fell in love. So comfy! @Sorcha - ooh what colours did you get? I have a lot of American Apparel skirts and dresses and although the prices always make me feel guilty I do get a huge amount of wear out of them. Much more so than a lot of cheaper high street pieces. Wait, is it henna that can turn blue green on top of dye, or dye that can turn blue green after you had henna applied??? Be cautious before doing anything else, Laura! I bought Boots No7 tinted self tan lotion a few years ago and literally EVERYONE commented on it....even my dad said it looked "glowing" lol. I love this fake tan, I have been a fan for a while and now that the winter months are rolling in (and my holiday tan is fading) I will be using it a lot more, although I always find that I must walk in the tan that is on the bathroom floor and my feet are always REALLY tangoed!! Maybe it's just be moving around too much when spraying, but I'm not sure if anyone else has ever experienced this problem but if they have please let me know and if you have a full proof way to prevent it! Very cute details of your look! 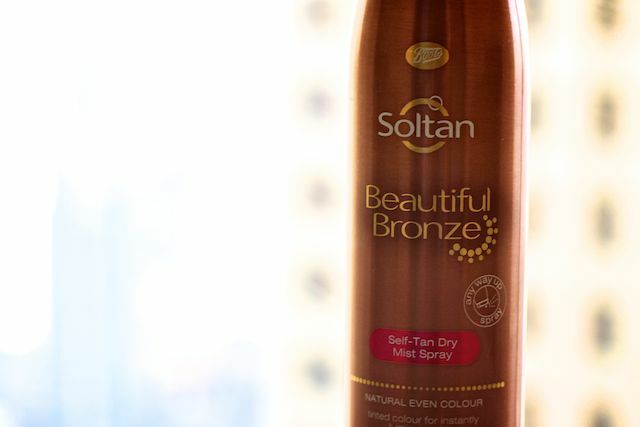 Does the Soltan have one of those fake tan smells to it? one thing I struggle with is finding a tanning product that doesnt have the obvious fake smell. hey check out my blog on beauty and Skin care!! Must get me one of those skirts! I got a really bad henna job done once (yours look nice!) and it took weeks to fade, theres was alot of blobs and squiggles going on! My absolute favourite tanning brand is Make Believe. Again no patches, beautiful colour, quite a pretty fragrance and they even have a product specifically for 'winter glow'. I do like the price of Soltan though and may give it a go, Make Believe is much more expensive! I bought a very similar skirt from Forever 21 ! They only had it in black or navy blue. Super cute outfit! I totally hear yah, working from home usually allows you to resort to "comfy" clothes, but there is nothing like the feeling of wearing something fabulous and looking wonderful! Have you had your October Glossybox. mine has arrived.!! The only bad henna job I've seen, I did myself lol. But that is a pretty dull pattern compared to the intricate designs I've seen. Also, your skin looked great, you don't need the fake tan! Helloooo... I love your outfit ! How do you get your white tee not to be see-through !? And do you livee in Dubai noww ??? I really love the look- effortlessly chic :) And needless to say your purse is just amazing! Hey, do you hav a link to the tee please? Love your Tiffany diamonds by the yard necklace--can I ask what carat size you got? I'm considering a purchase and need some kind of gauge as to how the different sizes look on. Thanks in advance!! I wish i could buy this but sadly I can't! no boots here in Korea! Mist spray tanners are the best! Can't get even one type of them here so I use the St tropez mousse instead. It's fairly decent. Your outfit is just great and the styles you have mentioned that can be done with the outfit are really worth giving a try. To have any aesthetic improvements CosMedocs offer wide range of aesthetic treatments worth trying. For split second, if you are making use of Blackberry Device, www.whatsuply.com overview on how you can mount whatsapp. click Install to download and install and also mount the video game on your phone. ACMarket it constantly assists the customer to find plainly while checking out.